My STEM students all have their favorite challenges! Fourth graders love cooking pancakes and building roller coasters. Fifth graders love catapults and Newton's Cradles. 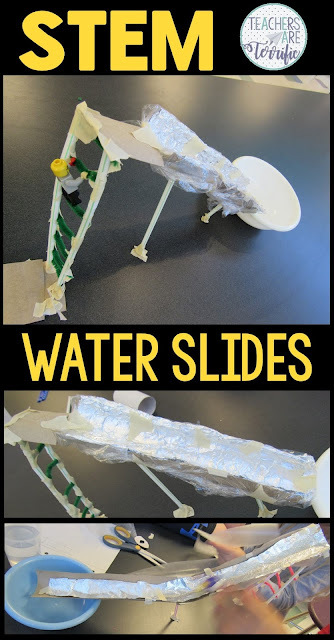 The hands-down favorite challenge for third graders is WATER SLIDES! When I first started working on this challenge a few years back I knew kids would love it. It's messy, but it's just water that splashes- which is usually pretty funny! Take a look at this spectacular project! I love this one because the main material is cardboard rolls that my parents send in. I have boxes and boxes of these! If you don't already get donations from parents this is a good place to start. Just send a note asking for cardboard boxes and tubes. Mention the word free in your request and people will send those in! Another material to think about involves being waterproof because this is one of the main jobs the kids must do. The inside of the slide must be waterproofed. They have to line it with something! You can see the teams above using plastic wrap and foil to line their slides. The slide has to stand up! This is a little more problematic than you would think. Somehow they have to use the materials to make the slide part stable and tall enough to make a good slide. A lot of them use the tubes for this, but there is another part to the requirements that involves a ladder. Take a look at the ladders below! Didn't they do a great job? One of the task rules is that they must have a ladder attached to the slide. Many of the groups will try to make the ladder double as the leg that holds the whole device up in the air. Sometimes this actually works! This is the most fun thing ever! When the ladder is attached and the slide is stable, then Lego man takes a ride down the dry slide. This lets the kids know if the slide needs any more work before they try the water. Sometimes they will have spots that cause the Lego man to stop in the middle. Great problems to solve. All of the slides above have the ladder holding up the whole device. Notice those extra legs they added to help hold the slide up. Pretty clever! Time to add that water. One student holds Lego man in place while another starts the water flow. When they are ready they let go of the toy and down he goes! I promise this challenge is easy to set up and easy to clean up! I use real towels in my classroom rather than paper towels. I find that a real towel will soak up more water than paper towels. I either take a basket of laundry home or use the school washer/dryer when we finish Water Week! Definitely, put this challenge on your list of projects to try! I saw that in the Constraints it said to have a curve in the slide. Do you have any photos of that? How to Control That Flooding - Grab Some Towels!